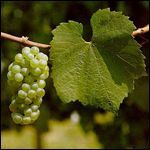 White grape variety that makes some of the world's greatest white wines. It is the flagship white grape of Burgundy where it dazzles on the Côte de Beaune in the Grand Cru wines of Montrachet, Musigny and Corton-Charlemagne, to name but a few. Pouilly-Fuissé is an opulent, full-bodied wine that comes from the Mâconnais region of Burgundy, another celebrated Burgundy style is lean, mineral Chablis. Californian Chardonnays are highly esteemed and it makes some impressive wine in the cooler climate regions of South Africa, New Zealand, Argentina and Chile. Champagne made exclusively from Chardonnay is labelled Blanc de Blanc, where it is also used as a blend with Pinot Noir and Pinot Meunier. It is being used increasingly in the production of Cava, and in English fizz it makes some stunning examples! Chardonnay loves chalk, lime stone and clay soils, but it's a chameleon-like grape and can adapt easily to almost any ground where it will take on the flavours of the terroir. It also has an affinity with oak, and winemakers use this in varying degrees, resulting in a wide range of flavours, and layers of complexity from light melted butter examples to rich weighty wines brimming with butterscotch and vanilla.